The Ricoh Aficio SP C231, C232, C242, C311, and C320 series printers are among the most popular printer models for small to medium size business customers. 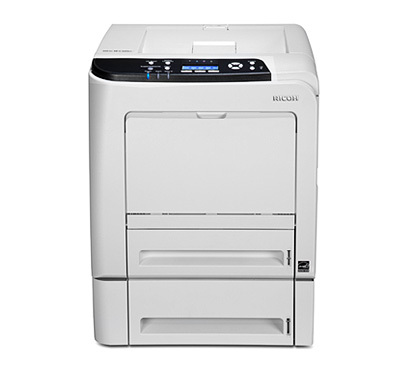 This durable machine can print up to 26 pages per minute for both color and monochrome documents with maximum resolution up to 1,200 dpi. In addition, the low defect rate and the availability of high quality re-manufactured toner cartridges made Ricoh Aficio SP C231, C232, C242, C311, and C320 series printers an ideal candidate for the office environment. Normally the price for a same model genuine OEM toner cartridge can go as high as $200 a unit, but it’s now priced at $69.99 for the black unit and $89.99 for each color unit at Toner Spot. Imagine how much more you can save with our summer promotion! Don’t forget to use our coupon code HOT2015 for 10% off your entire purchase during our summer promotion. Save even more with free shipping when orders exceed $75 contiguous U.S. states. Bulk order inquiries please contact sales@toner-spot.com. As the old saying goes, a dollar saved is a dollar gained – This is especially true when you can better spend the money that you saved into investments that can help grow your business. Although saving money can be tricky when running a business, trimming overhead sometimes is not only a matter of making more profits, it might be the key to your business’s survival. We have compiled a short list of items that not only can help lower overhead costs but can also help the environment by reducing unnecessary consumption. This is a must in this day and age with the increase use in tablets and cloud computing. Not only can saving on materials save you money directly, this can also be a time saver, which in turn saves you more money. When you do have to have hard copies, consider looking into having regularly used forms printed and on-hand as opposed to photocopying them, as this can be a less expensive route. You may also want to consider upgrading your printer to the ones that allow double sided printing, which can save you considerable amount of paper every year. Recycling not only saves you money but it is also good for the environment. 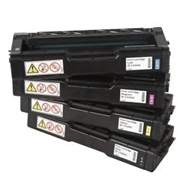 Printing ink and toner cartridges can sometime be one of the main costs for businesses. 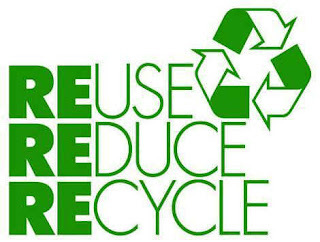 Buying recycled or remanufactured printing supplies can often times save you up to 70% of your ordinary printing costs. You can also stop that plastic cartridge from being one of the 350 million printer cartridges already in our landfills. Although it is tempting to purchase new and shiny items in your office, it is much more prudent and environmentally friendly to purchase used office furniture and equipments that are in good condition. 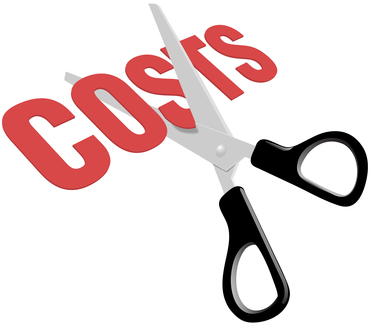 Look around the internet or contact local office equipment supplier and you might be surprised how much money can be saved with used or reconditioned office furniture and equipment. You may be surprised how much money you can save through simple moves such as changing to the right light bulbs or keeping the equipment on a power strip and turning the power strip off when not in use. Since the object of many environmentally friendly changes is to save energy, and you have to pay for the energy your business uses; that means if energy consumption can be reduced, you will also be cutting down costs. There are also many solar programs out there that require very little up-front cost through leasing or financing that will dramatically reduce or eliminate your electric bill. Consider contacting your local solar equipment providers for more details on how going solar can save you money. We hope you find the article above to be helpful and we welcome any comments or additional ideas that we should add to our list. Toner Spot is a remanufactured printer cartridge provider and we can help in reducing your business costs through high quality remanufactured printer cartridges. We offer One year manufacturer’s warranty on all purchases made through www.toner-spot.com. Thank you again for reading! Print quality problems are not only caused by consumable parts, other factors such as mis-installation and un-cleaned printer parts often contribute to poor quality prints. We have gathered a few print quality issues and common solutions for the Kyocera Mita FS-C5400DN printer. We hope that these do-it-yourself solutions can help you resolve the print quality issues. This issue can happen after the initial set up of the printer or when the machine has been physically moved. Switch the printer off, wait for few minutes, and turn the machine back on. This procedure will prompt the printer to conduct color calibration. Check if the issue has been corrected, otherwise, try to conduct the color calibration from the operation panel. However, the manual color calibration steps from the control panel are more complex and can affect the printer settings. We recommend contacting a technician or emailing us at sales@toner-spot.com for direct assistance. Pull out the paper transfer unit. Clean the paper ramp using a soft, dry, and lint free cloth. Be careful not to touch the black transfer roller and black transfer belt during the cleaning process. 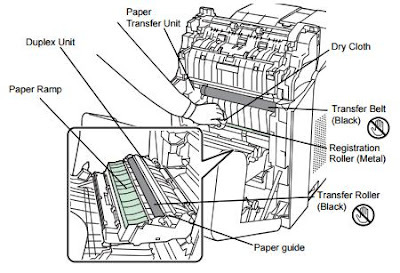 For more information on Kyocera Mita FS-C5400DN printer troubleshoot, please email us at sales@toner-spot.com or visit our website at www.toner-spot.com. All website orders received one full year warranty and covered under our 100% Satisfaction Warranty program.